High Fibre lunch recipes, Fibre Rich Indian lunch recipes. High Fibre lunch recipes, Fibre Rich Indian lunch recipes. It is always advisable to have a heavy lunch than dinner. This is because you are only half through the day and the food could be easily digested before the day ends. Make a meal rich in fiber to keep you satiated for long hours and avoid bingeing on those unnecessary snack in the later part of the day. Bajra and Jowar are rich in fiber and opt for basic jowar roti or jowar pyaz ki roti. For bajra lovers there is the basic bajra roti and stuffed bajra roti with panner and methi which is also a gluten free roti. Toovar Dal, chana dal and urad dal are rich in fiber. Opt for methi toovar dal or basic chana dal or basic urad dal recipe. Check below for more dal options. Cauliflower is fiber rich and makes great cauliflower stir fry or cauliflower paneer subzi. Karela is not only fiber rich but a big friend of diabetics. Opt for karela capsicum subzi or masala karela. Then carrot is super good for your eyes also, try this carrot methi subzi. If you are at home, opt for a whole meal. This would include a soup, a salad along with vegetable and just about a small portion of roti. Asparagus Soup, Chatpata Chawli and Fruit Salad, Masala Karela and Lehsuni Bajra aur Kaddu ki Roti are a few recipes which are surely worth trying. However if you are looking to carry a fiber rich meal to work, try recipes like Stuffed Nachni Roti, Khumbh Palak and Bean Sprouts and Suva Tossed Salad. Be it any option you choose, do not miss out on checking the fiber content of each of these recipes shared herewith. A little know-how of how to use these healthy ingredients can go a long in way creating an unending range of innovative delicacies to please your palate and give you boost to lose weight further. 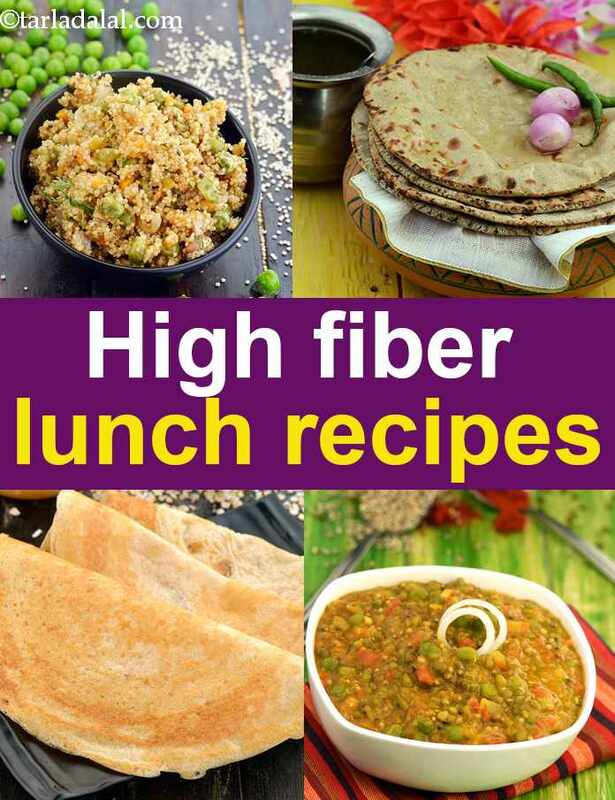 Enjoy our High Fibre lunch recipes, Fibre Rich Indian lunch recipes and other fibre rich articles below.